I had heard horror stories of BMW Catania before I ever had any dealings with them. In fact, I didn't WANT to have any dealings with them after hearing how they directed one friend to back his Mini right into another car in their own parking lot, how they charged another 800 euro (a thousand bucks) for a regular service on her BMW, and how a colleague had hers returned minus the radio. ("There's just one small problem, madame. Your radio has been stolen.") In addition, the dealership is in a horrible location in Catania, on the very busy and crazy Via Marco Polo, there is no parking (except double parking on said Via), no one speaks English, and it's nigh impossible to figure out who you see for what. Sigh. This was not good news. I had had bought two new BMWs and then this Mini in Germany, where the service was, well . . . excellent!! A little brusque in a German sort of way, but excellent! I never had to leave my car overnight, was never overcharged, and they always hauled out their best English-sprecher to talk to me. Ok, that was Germany, this is Sicily. Shift (mental) gears. Downshift. Several times. So, I avoided them, had local mechanics (Tony and sons) perform some minor service and repairs, and got away with it for a year and half. Then my luck ran out. The fan wouldn't shut off. Then it stopped working all together. Tony and sons could not fix it and I would have to take it to the dreaded BMW Catania. I talked Tony into going with me. He's a Sicilian-New Jersey-Sicilian who set up shop near the Navy base. We drove the Mini down there hoping to not get caught in traffic since the fan didn't work at all now and finally got to see the service manager, a young man called Marco. He said they were too busy and couldn't take the car. I said it was an emergency, it was undriveable. He said it wasn't possible till the end of the month (2 weeks later). I went into an explanation of how I had three BMW products, how the Germans were always "pronto" with their service, yadda-yadda-yadda. Tony translated for us. Then Marco called in "the boss," a shady-looking character in sunglasses and a Mini baseball hat who agreed that they would take it. They were even persuaded to do a much-needed servicing on it while it was there. Ok, ok, 3-4 days, though. I signed all the papers, gave them Tony's phone number and we left. Of course, I didn't hear from them for two weeks . . . so they actually DID have it at the end of the month . Today I got a call from Tony, "BMW called. Your car is ready." "How much?" I asked. He hadn't asked them, but judging from the gouging that others had taken, I thought at least a thousand euros . . . . I took my credit card. Marco was much friendlier. We now had a "relationship" in a Sicilian sort of way. We knew people in common. He got the bill and I was more than pleasantly surprised that it was "only" 517 euros! Woo-hoo! Marco carried my gym bag, escorted me upstairs to my car, made small talk, shook hands, and off I zoomed onto Marco Polo. Once in traffic, I found out I had NO gas and prayed the whole way up the hill . . . the gauge was on ZERO . . . I had never had it this low . . .(did I mention it was pouring down rain and windy?) . . . but somehow made it to a station and tanked up for the rest of the drive home. Maybe I should buy a Fiat? I didn't fall under the charm and spell of Siracusa until about my third or fourth visit, and it was Ortigia (aka Ortygia), an island and the oldest part of Siracusa, that did it. I was afraid Siracusa was going to be another Oberammergau, a place that everyone raves on and on about it and I always thought, "This place is boring. What's all the fuss about?" But, no, Siracusa came through and hypnotized me as it has so many other visitors. In fact, several of us have expressed that same desire to live there--it has that kind of pull on us. Oh, it's ancient, all right. It was the second Greek settlement in Sicily, founded by the Corinthians in about 734 B.C.! In ancient times, it was much bigger than it was now, perhaps several hundred thousand people lived there. Today is it less than 75,000. 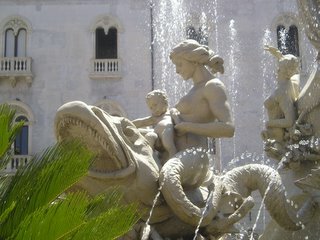 To read a quick overview of Siracusa and its history, complete with photos, go to The Classics Pages. 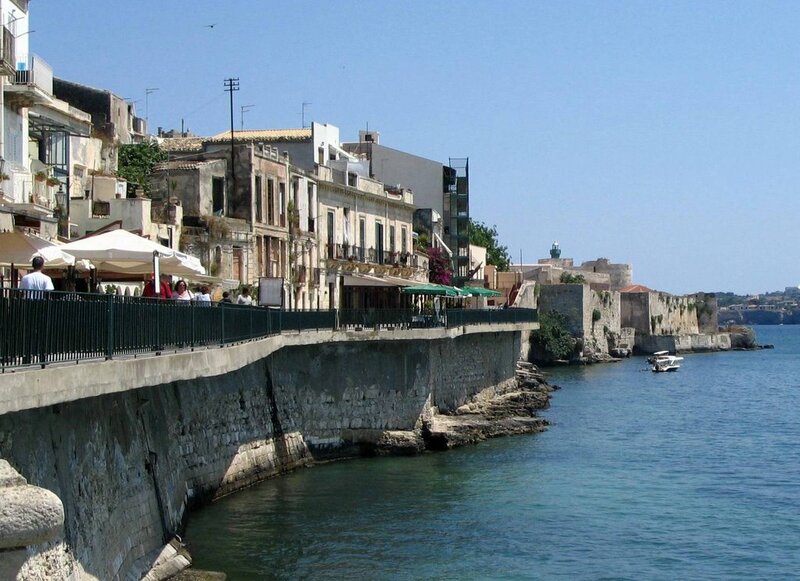 There is plenty to see outside of Ortigia, but I rarely go there unless I have visitors who want to see it. Ortigia is the place I go to wander, wonder, marvel, and dream. Most of it is in disrepair, making it even more charming and "ancient." It is a maze of tiny, twisted streets. There are few driving streets and practically no parking, so the lack of cars makes it very pleasurable indeed for walking. Besides just wandering and wondering, my top three specific locations are the Duomo, the seafront near the Fountain of Arethusa, and the Piazza Archimedes. The present Baroque Duomo (cathedral) is most amazing because it was also Norman, possibly an Arab mosque,and most definitely the Greek temple of Athena in earlier times. 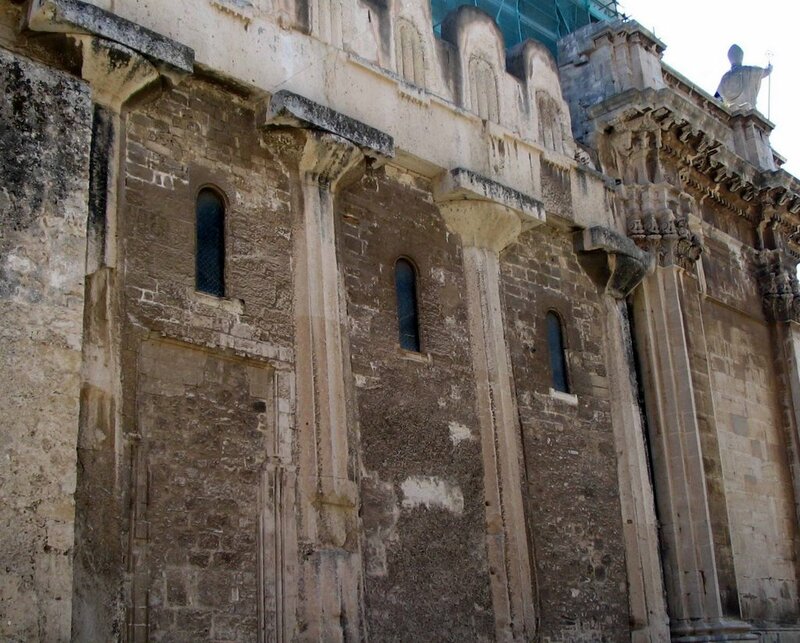 The original Greek pillars are still visible in the walls, inside and outside! I love that kind of thing . . . . Since seeing that, I've noticed that all the other churches in Sicily have Greek pillar replicas (some just painted on the wall) on the interior. The baptismal font of Siracusa Duomo is an original Greek brass bowl. The seafront on the west side of the island near the Fountain of Arethusa has several little restaurants in a row right on the edge of the water. 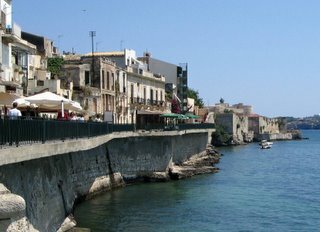 This is the place to have something wonderful to eat (especially seafood) or just a drink, relax and take in the scenery and atmosphere, which includes the bay, boats, people, and surrounding older, more decrepit part of Ortigia. The fountain itself has papyrus growing in it. Archimedes. It is beautiful in any season, any light, with a variety of statuary showing Arethusa's metamorphosis into a spring. Even if you didn't know that, you'd enjoy it, as I do, just for the sheer beauty of the fountain and the water against the background of the different buildings around the piazza. Beyond these three places, it's best to just wander about, past the churches, palaces, the 13th-century castle-fortress, through the Jewish quarter. Stop, look, breathe . . . There are countless old buildings and apartments for sale or rent in old Ortigia, most of them in dismal disrepair. We keep thinking this would be the place to buy, restore, and live. There are people, even foreigners, doing exactly that, so it's not impossible. We have no idea what that would cost, but it's a lovely, tantalizing dream. 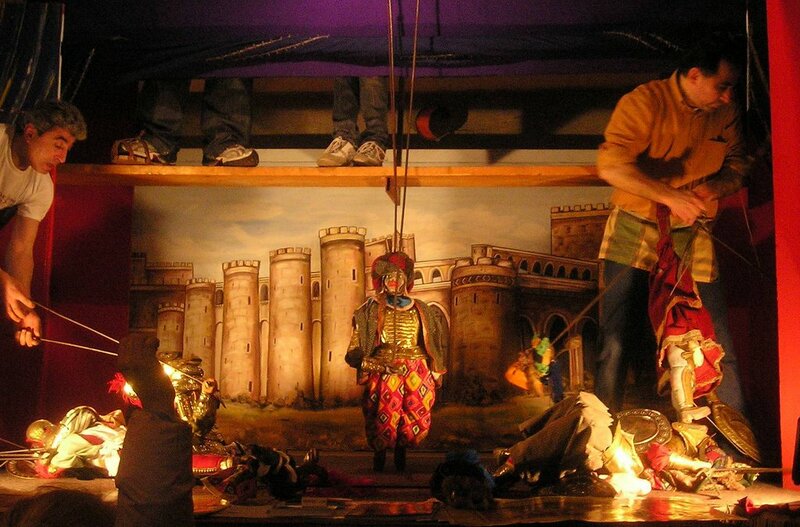 Today I went to a Sicilian puppet show. 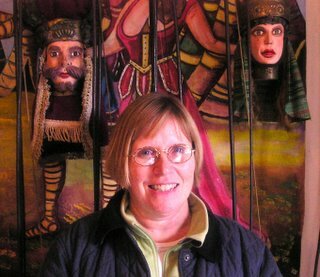 This is no ordinary marionette or hand-puppet show. 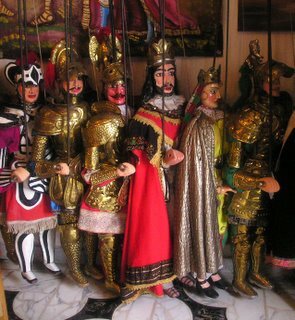 The Sicilian puppets are old, traditional, huge, and violent! They are hand-crafted in solid wood, wear metal armor, and brandish swords. We had an explanation of the theater and the puppets and later got to see just how it was all done behind (or above) the scenes. The puppets weigh as much as 60 lbs., so it's quite a job to handle one. 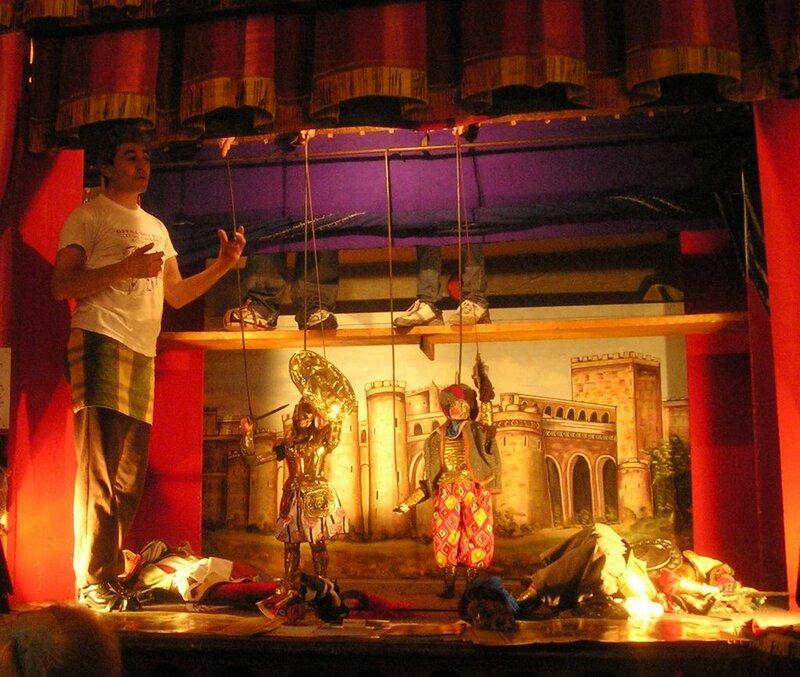 In this case, at the Opera dei Pupi Turi Grasso in Acireale, Turi and his staff do it all--sound effects, costuming, staging, and selling of souvenirs. Mr. Turi Grasso inherited this trade from Emanuele Macri, who noticed Turi when he was only sixteen and regularly attended his puppet shows. Emanuele himself was the protege of Mariano Pennisi, the most famous puppeteer in Sicily, who rescued Emanuele from the 1908 earthquake in Messina and raised him as his own son. (Thanks to Andrew Wilson for this story.) Emanuele toured Europe with his puppets, and the theatre became world famous. Anyway, today the theater is in a very modest but well-decorated building that will seat a few dozen people. The show itself reminded me of my opera experience-- I didn't have a clue as to what was happening in the story (even with the handout). They were very funny to watch because their legs don't bend but they talk a LOT with their hands like all good Sicilians. Suffice to say that it was THE most violent puppet show you will ever see. The Crusader puppets (Orlando, Rinaldo, and others) spent 45 minutes fighting off the Turks, snakes, giants, a dragon, and the devil himself. They fought with swords, crashed and bashed each other, often flying all the way across the stage, and many puppets were decapitated in the process. In the final scenes, all the Crusader puppets were killed off (even the female one), all the Turks were killed off, and piles of puppet carnage littered the stage. (Point of interest: the good guys always enter stage left and the bad guys stage right.) Finally, the battle came down to the devil, representing the Turks, and Archangel Michael, representing the Crusaders. Guess who won?? Scicli, pronounced SHEEK-lee, is a strange little place. 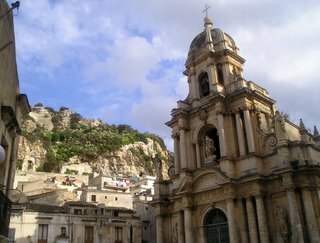 On the one hand, is it a beautiful little Baroque city nestled in the rock hills in the southeast corner of Sicily. On the other, the rock hills are riddled with ancient caves, dating back to the Second Bronze Age (1500 B.C.) Like Sperlinga, some of the caves are still occupied, or at least used by people! The town is named for one of the orignal tribes of people in Sicily, the Siculi. Scicli is a UNESCO site, a protected place which receives funds for restoration work. 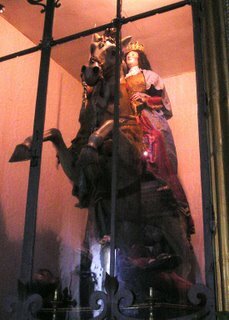 The Matrice Church has a rare lifesize Madonna on Horseback that is taken out once a year, in May, for a festival celebrating her saving the people of Scicli from the Saracens (Arabs). 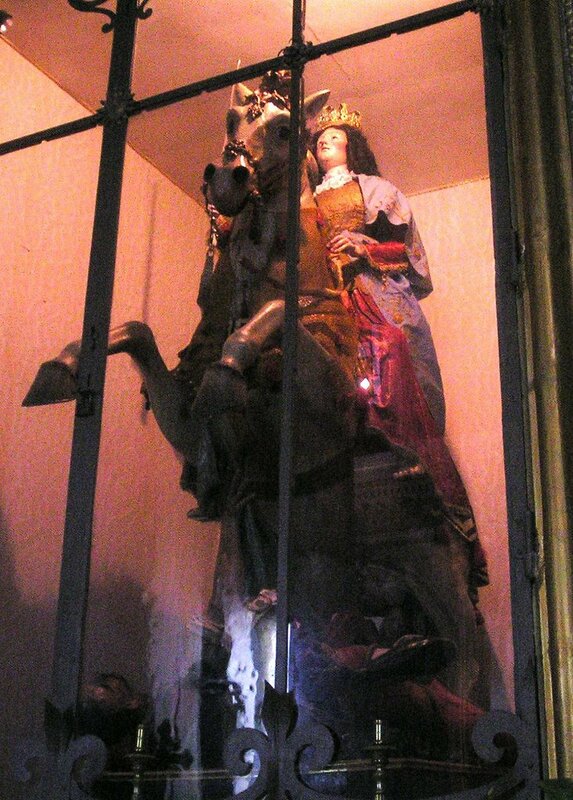 In fact, the statue shows her trampling over one. The same church also has a solid silver casket said to be holding the bones of St. Ignazio, to whom it is dedicated. Possibly THE most ornate Baroque interior I have ever seen is found in St. Bartholomew's Church, a block or so away from the main piazza. 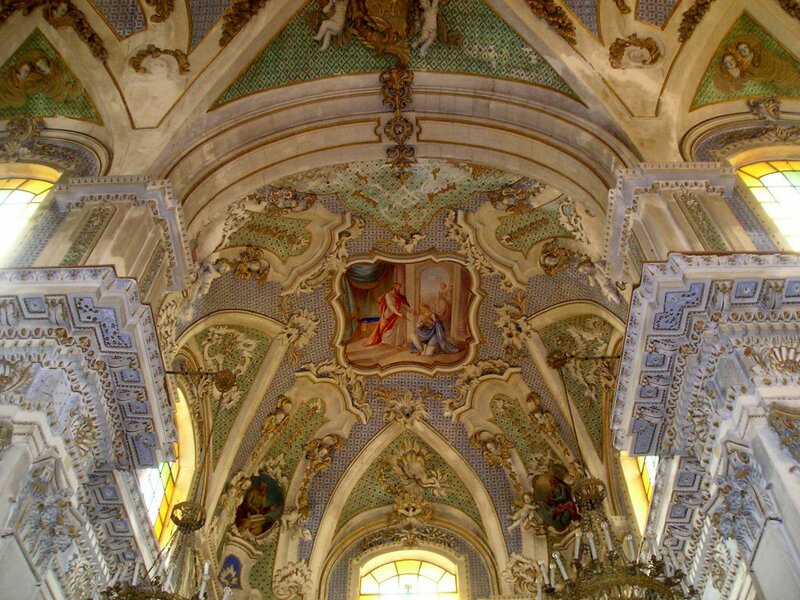 The ceiling paintings and ornamentation covering every square inch of the church are a sight to behold. And yet, it is pleasing to the eye overall. The story of St. Bart himself is not so nice. Our funny little Italian guide said, "You know how he die? Day skeen heem, like a rabbit!" And sure enough, there are paintings in the church depicting the horrid event, poor Bart's skin lying in a heap. These Sicilian saints always seemed to die horrible, painful deaths. Anyway, since we were on a day tour, we did not have time to climb up and explore the ancient caves, although you can, or the ruins of the oldest church in Sicily, St. Matthew's, that is dated back to 1091. That will have to wait for a later visit. We spent most of our time walking around admiring and photographing the Baroque buildings and checking out a trendy coffee bar and a wine shop. The details are what make the Baroque interesting--the window and door frames and especially the balcony supports. 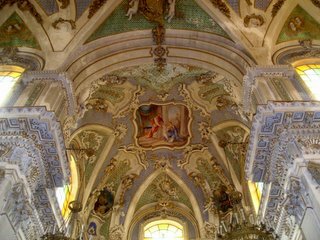 Thanks again to the earthquake of 1693 for providing us with all this Baroque in Sicily! 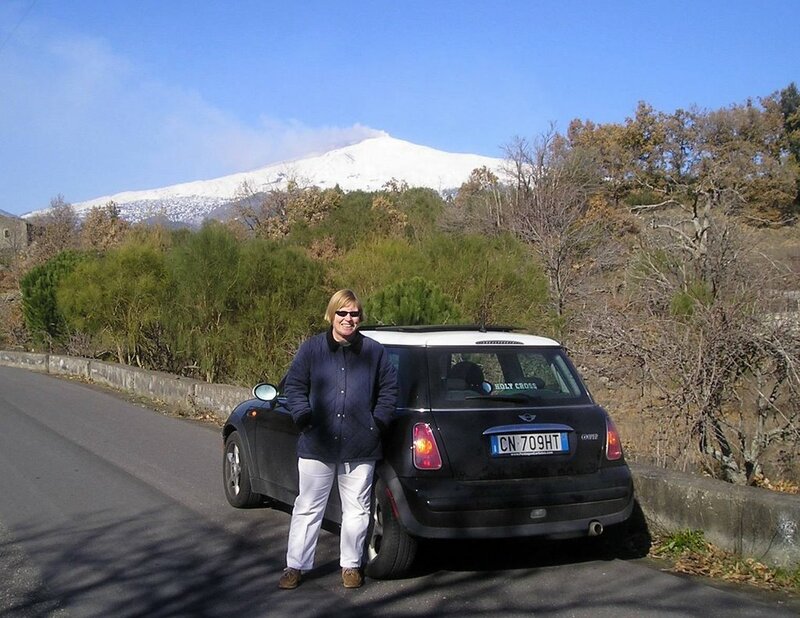 Check out my Photos of Sicily to see Scicli yourself. I went into school a mid-day to get some things ready for my sub tomorrow. I was in my classroom on the second floor of a four-story concrete and brick building only a few years old when the building definitely started to sway . . . one, two, three, four times! I grabbed my jacket and glasses and was about to run outside when it stopped. A little later, my friend called and said it had caused her recliner, sun-catcher, and wind chimes to rock and roll, too. 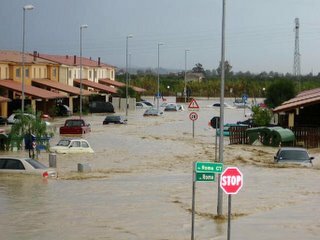 When I got home, I had an email from a friend asking me if I had felt the earthquake they had in GREECE but felt as far away as ITALY. It turns out it was a 6.9 level earthquake that was 40 km (or 26 miles) deep! Geesh! If you click on that link and then put your cursor to the right of the bottom righthand corner of the picture (by the EMSC), you'll get a magic button to click and expand it. Then you can see that the tectonic plate boundaries run from the center of the quake right over to Sicily and Catania/Mount Etna. Aren't we lucky? Sicily might lose its reputation as a 2 1/2 world country if it's not careful. On November 23, 2005, the first real MALL on the entire island opened to huge crowds. It's called Etnapolis, and best of all, it's located between my house and my school! Woo-hoo! It doesn't look like much from the outside, but inside--oh boy! It's a shiny, American-style mall, even better than anything I've seen in northern Europe! It's got 110 stores, ten restaurants, a multi-cinema, and more on 270,000 sq. meters. There are 6,000 parking spaces (all paved and most covered). Best for the local economy, perhaps, are the 3280 jobs that have been created! 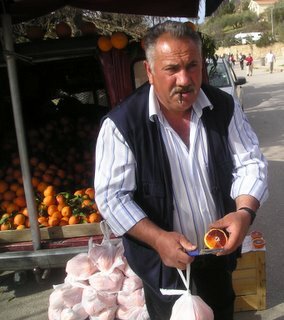 The Sicilians love it, and traffic jams to and from it are the norm and have been since day one. They walk around in it like it's Disneyland, which it is for Sicily. It has ample, lighted, lined, and free parking underneath. That alone is something I have not witnessed anywhere down here. What, no seedy little "parking guys" to guide you in and take your small change? Upstairs, there are two floors of shiny new stores. Like any American mall, it has a big super department store (Carrefour, a French company) and lots of other clothing, electronic, and speciality stores. Maybe the only things that distinguish it as Sicilian are (1) the over-abundance of underwear stores (they love underwear stores for some reason) and (2) the Italian "bars" selling expresso and other coffees. Oh, yeah, there are tons of cell phone stores, too. Even the bathrooms are like American malls. The Siclians I observed were confused and shocked to walk into a shiny public restroom with multiple stalls of toilets, all working and ALL with seats! Unheard of! And no little plate of change for the restroom attendant! Mamma mia! Another cool feature is the absence of smoking anwhere in the mall. Italy already is ahead of Europe with no smoking laws for restarants, but this is for the entire Etnapolis mall! Besides Carrefour, a kind of giant Super WalMart, there is a Home Depot-type store called Castorama at the other end. I have never seen such a store in Europe, and I'm quite sure nothing like it exists anywhere else in Sicily. It's huge, well-stocked, clean, and comprehensive. So, once they get all the stores up and operating and the exterior landscaping and parking lots finished, Etnapolis will be the showcase of the island inside and out. It will remain to be seen, though . . . will people really give up their street markets, hole-in-the-wall stores that look like Arab bazaars, and the fun of double or triple-parking for . . . convenience?? Stay tuned, because it looks like they will. 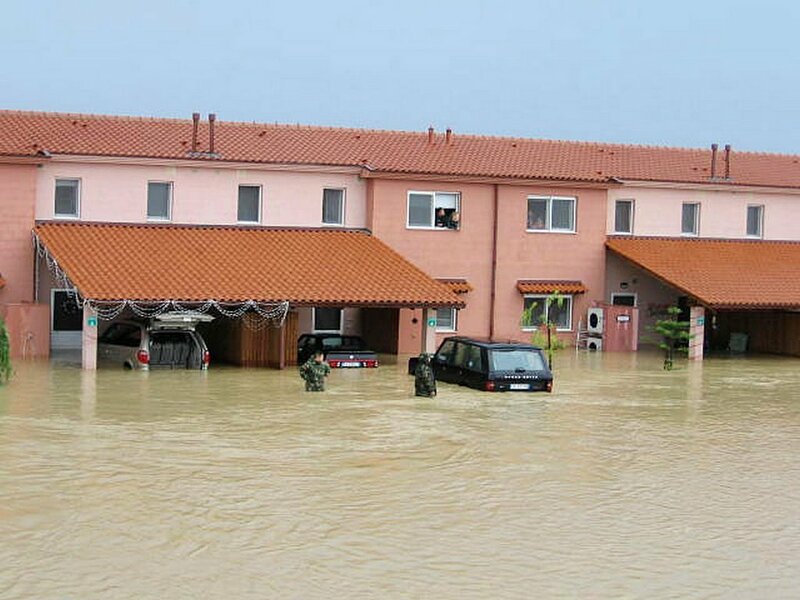 A colleague who was evacuated from her house in Marinai sent these to me . 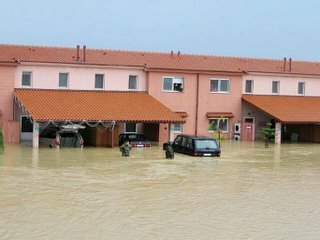 . . Over two hundred families have apparently already been moved back in and they hope to have the rest back in the next two weeks. Oh, be SURE to look at this little video clip . . . it comes on automatically for you.